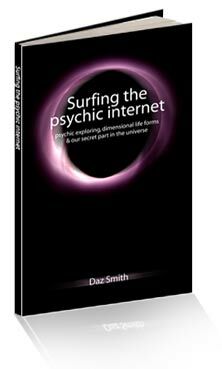 Surfing the psychic internet is a mystical journey into the hidden dimensions that surround us all. It charts the explorations of a small group of psychics, through the eyes of Daz Smith to far off worlds through a dimensional portal that they create. Throughout these travels we communicate with and meet Alien beings, Angels, Spiritual masters and a dark presence that stalks the psychic traveler waiting for a time to strike. These experiences also contain some of the most fundamental and insightful answers to the questions we all ask in our day-to-day life about mankind and our personal place in the universe. The psychic internet exists all around you, it flows through you, it is you. By reading and using this this book as a guide you too can explore its potential and surf the psychic internet for yourself.